Since I had a box of unopened Twinings Irish Breakfast tea, I decided to email the KLBD regarding whether the box was kosher l'Pesach year-round. Here was the response (they are amazingly quick, btw; I sent the email erev Shabbos! ). Twinings Irish Breakfast Tea is not Kosher for Pesach. Medicines section, be sure to buy your copy. There you have it. I'll have to settle for Wizzotsky tea for me over Pesach, it seems. Unless someone knows where to find kosher l'Pesach Red Rose. Gosh, do I miss that brand. And please, don't even bother suggesting Lipton. I'll never forget the first time I drank a cup; I had the distinct feeling that I was drinking recycled tea. YUCK. So, I thought I was in pretty good shape. Then I made The List of what's left to do. DARN IT! I know that the reward is in direct relation to the suffering involved, but can't a gal catch a break already? I was really looking forward to this year being the year when I broke the cycle, and was actually ready a few days before. Not a week mind you- just like, Monday. Versus Wednesday morning when it's time to burn chometz. Yes Pesach is over a week away. But I am SO over cleaning after yet another full day of scrubbing with steel wool and blowing through rolls of paper towels. Since it's down to the crunch in terms of cleaning and shopping, I can now look forward to added stress because who wants to redo already cleaned areas, chasve shalom? So, rather than deal with the extra caution I'm going to have to exert until a week Wednesday, I just want the whole penultimate week to be over and done with. Inspired by Barb Chansky (see Barb's World), I had a belated question spawned by Purim. Having witnessed the usual parade of Esthers and Mordechais, etc. etc. for yet another year, I had to ponder: why don't girls want to be Vashti? When I was a kid, that's what I wanted to dress up as! Esther was so BORING. I mean, why be the Good Witch of the East, when you can be the Wicked Witch of the West??? We all know the WWotW is oh so much cooler than the Good Witch. Why else would "Wicked" be such a huge phenomenon? There I was in Moishas this evening, finishing off a bit of preliminary Pesach shopping (read: I bought my Shabbos toothbrush/toothpaste) when an image hit me. I would imagine that all of the birds in Flatbush are currently being very well fed, what with the kilos of chometz being strewn upon the streets whily-nily. So can't you picture it? Flocks upon flocks of fat, stuffed-to-the-girls birdies! For one month a year, the birds develop a weight problem, LOL. I keep meaning to write down a dvar Torah, and then keep right on forgetting. It really is the pre-Pesach crunch! Anyway, here's a thought that occurred to me earlier this week. In the 4 parshot leading up to Pesach, we have detailed accounts of the mishkan and other holy vessels, the bigday kehuna, and various sacrifices recounted. What is the correlation between these accounts and our proximity to Pesach? In the 4 weeks between Purim and Pesach, we are busy scouring our houses, ridding ourselves, our possessions, and our property of chometz. As we know, on a symbolic level, chometz represents the negative side of the spiritual equation: tumah, averos, etc. The very purpose of our cleaning is to elevate ourselves spiritually in preparation for our spiritual commemoration of the exodus. Similarly, the purpose of the mishkan, the bigday kehunah, the sacrifice services, and so forth were to each atone for any short-comings, chasve shalom, of the klal. Thus, just as the Pesach offering and exodus cleansed the klal of the tumah of slavery, and set them in an upwards spiritual arc that culminated in the revelation at Har Sinai, so now Pesach cleaning prepares us for the reliving of the exodus on Pesach. Similarly, just as the the holiness of the vessels, garments, and sacrifices atoned for the klal during the eras between the exiles, so too does the retelling of these holy articles help cleanse us in preparation for the spiritual geulah on Pesach. And in the merit of such cleansing, the eternal hope is that this Pesach will mark the beginning of the ultimate geulah, with the coming of Mosiach. I called my big brother a while ago to ask what he would do about my stove/oven situation for Pesach. I figured that since he's a bachelor, he could weigh in on whether I should bother with trying to kasher the old-as-heck stove or just sell it and buy a single burner for $10. Problem is, it seems that I can do neither. In fact, it would seem (to my utter horror), that I will in fact have to clean both the stove and the oven regardless of whether or not they're sold. I'm still in disbelief. What about my easy Pesach cleaning this year? What about my avoiding doing anything to aggravate my mid-section? WHERE'S MY GET OUT OF JAIL FREE CARD? I should sooooo have been in bed about 4 hours ago, especially considering that I have a really important day at work tomorrow. But I've been dealing with a nice case of insomnia the past several days (DUH- look at the time I'm posting). Think it might have a wee something to do with, uhm, my stress level? You can find the song (and lyrics) below. Awesome! "Oh to touch the people, to really feel them"
My body reminded me today why cleaning for 7 hours nonstop is a bad idea. I'll never forget the month between Purim and Pesach the year after the accident. I was in utter agony. Anyhow, B'H', I guess I've learned my lesson the hard way, i.e. any Pesach cleaning = twisting and turning, which a total no-no for yours truly. Time to take heed and avoid any repeats of yesterday's stupid behaviour. Consider me that much older and wiser. Amazingly, I spent from 10 AM-5 PM Pesach cleaning today. That's nonstop, except for the break I took at a quarter to noon to daven. Ok, and to have a bowl of ice cream. It has cookie bits so it's chometz and a mitzvah if I eat it! The funny part of it all is that once I hunkered down and started doing it, it really wasn't all that bad. And, since I had already decided that this year I would be a bastion of practicality and restraint, I made pretty good headway. In short, I've avoided the temptation to go overboard, which basically home means I've decided that while I'll scour the counters, I'll refrain from the boiling water part, and that I'll rinse off containers of hand soap that are kosher l'Pesach instead of buying new ones. And you know what? Suddenly Pesach is looking a whole lot more enjoyable than the last few. And when you stop to think that people used to just sweep their floors and sell their chometz, isn't that the whole point? Drat. Just when I thought my Mom would be having a great week (she had a bunch of outings planned), I learn this afternoon that all heck broke lose instead. Sigh. Why can't the poor woman catch a break??? Anyway, it just underscored how much I wish I could just arrange things to head back up north for a while and help her out. With Hashem's help, hopefully I can arrange something. On a totally different note, what was with the snow this morning? I understand that spring has not really sprung yet, what with the cool nights still upon us, but I will admit that I thought snow was no longer in the cards. Well, it certainly isn't the first time I've been wrong, LOL. I know I'm long overdue for a dvar torah. Truth be told, I barely got through the parshot and haftorah by today. Bli neder, I'll be able to get one in before Pesach. Here's wishing everyone a good Shabbos! While it's true anytime, in this economic climate, it's particularly true- you can never bank on your job from one day to the next. Today the axe fell on two workers who suddenly fell outside the scope of the budget for the current contract. The announcement email stated that the plan was to bring them back on board when the next contract is signed. Let's just say that I doubt anyone is holding their breath on that one. As for me, it added a timbre of apprehension to the latter half of my afternoon. Crazy as this job is, I am most grateful to Hashem for bestowing it on me. And I would love to stay on for the duration of the whole project, which I keep hearing ends next year. That is my hope anyway, bli ayin hara. So here is a heartfelt "Todah Hashem!" for letting me retain my job today. And, going forward, I'm thinking that it's actually only proper to thank Hashem every day. Period. My favourite characters were actually the parents, specifically Jessminder's parents and Jules' father. And there were some incredibly funny bits. The all-around best line, imho? "I've taught her full Indian dinner. Now the rest is up to G-d."
(Take that line and substitute Shabbos for Indian, and you could be portraying any Jewish mother.) So there you have it. A humourous, tznius film that deals with being different from the mainstream and trying to navigate your way. Definitely a theme relevant to yours truly's life, so I guess I now have a new Top 10-er for my list of movies. Grey Cat is definitely a Yekki. 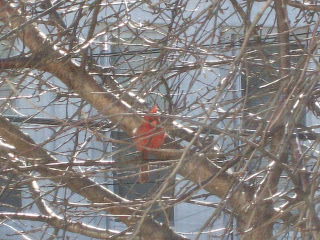 When Mr Cardinal went off in search of afternoon refreshment just now, the silence caused me to get up and look around for him. 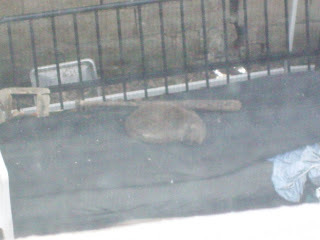 Which is when I looked down and saw Grey Cat all curled up as usual on the futon in the backyard. First, last week my mom went the doctor who "rolled his eyes" at her and told her to come back in a year. YAY!!! Pretty good for a Monday, eh? I went to Moishas earlier to do the Shabbos shopping, and to my utter horror found the place to already be free of most kitniyos. Most of my fellow patrons were similarly roaming the aisles, desperate to find the few cans of corn and other Shabbos necessities left. I very begrudgingly resigned myself to the fact that my scheduled Shabbos dish of dilled peas would have to be substituted by broccoli salad. And yet, what really got my goat was that Shushan Purim was barely over, and here I already found myself having to give up kitniyos! What gives?! I mean, I can understand turning over the shop by this weekend, because many women in Flatbush are already beginning to cook and freeze by then. But tonight? Can't we have one final kitniyos-loaded Shabbos before the countdown kicks off? WHO MADE THIS DECISION? The non-Pesach selection was so contradictory, it was almost comical. I say almost, because I was really fuming. Or, to quote a fellow shopper, "I can't deal!". No canned beets. Since when are beets assur? Frozen green beans gone, but fresh available. Frozen corn and peas gone, but canned available. Bread, corn chips, and other definitely problematic items? Plentiful. Yet I literally had to cry out "No!" and swipe a bag of okra before the stockboy pulled them all out of the freezer case. It was surreal. So hey, thanks so much Moishas. Not only are you feeding into the insanity, you're helping make the women folk miserable well before they need to be. Why make things so inconvenient a full month before Pesach? It's almost enough to make someone fry out, chasve shalom. When I woke up this morning, my hamentaschen high had definitely worn off, Shushan Purim or no Shushan Purim. Of course, I had no one to blame but myself for the crash; I tend to break up my hamentaschen and then eat as much filling as I can aka treat the dough as a container for the poppy seed. I eat soufganiyot the same way- eat the jelly, toss the dough. And, for that little moment, life was just perfect. A most fitting anecdote for Shushan Purim, no? "I could talk to you forever"
Now, you see? Right there's a prime example of the ability that Moms alone to make us feel oh so great. Mom, you're the best! Feel to weigh in on your favourite hamentaschen flavour! In my family, you should know, there was no apricot, raspberry or other "New World" fruit. It was prune or poppy, and prune was what you got if you weren't quick enough to swipe a poppy one. DH was kind enough, when we found poppy hamentaschen at ShopRite the other week, to stash the box at his office so that I didn't consume them all before the chag, LOL. Yes, I was also shocked when I received them this evening, and it hadn't been opened. May everyone have a wonderfully joyous, meaningful chag! Purim sameach! Since my faithful reader noted the alignment of the Obamas with Kennedys, I figured I should elaborate a bit on my previous post. To be honest, I was unaware that Jackie Kennedy chose to bare her arms in her official photo. Upon hearing that though, I discovered that in her official portrait she chose to cover her arms. My guess is that the White House recognized the formality due the portrait, but not the photo. Irregardless, in my opinion, her arms should have been covered in her official White House photo as well. Official = formal. Also, I will give a nod to the fact that informal, sleeveless garb makes the average American woman see the First Lady, whether Jackie and Michelle, as more like them, aka approachable. And I will acknowledge that while it wouldn't be my first choice if I was in their place, during candid press photos and day-to-day affairs, sleeveless may cut muster. But for formal events, official photo/portraits, or meetings with foreign leaders, formal attire is de rigeur. Donning a strand of pearls helps formalize a sleeveless gown. But it is not enough to provide adequate respect when acting in her official capacity as First Lady. Talking to staff in the White House kitchen? Maybe. Playing with her children? Definitely. Meeting Ms. Brown? No, no, and no. As I mentioned before though, I'm a foreigner. I guess I just don't get it. I could easily attribute it to having grown up with images of the Queen everywhere, and of the men and women of Parliament dressed in full suits (pants for men, skirts for ladies). But when I heard (and then, worse, saw) Michelle Obama's official White House photo, which bares her sleeveless arms, I thought "Enough is enough!". For every time and place, there is appropriate dress. More to the point, when it comes to leadership, it should represent not only its people, but the highest standard. As I quipped to my friend S this Shabbos, I want leadership to not be like me. In other words, I expect them to be better, to be la creme de la creme- the best the given group has to offer. Now, I can accept that Ms. Obama chooses to show her arms in press photos and so forth. After all, to do so represents Americans, who are known internationally for their very casual mode of dress. But in a photo that officially represents the highest office of the country that views itself as The Country in our 192 nation world? That I find inappropriate. Then S shared with me a tidbit that had surprisingly missed the headlines. In his recent visit with British PM Gordon Brown, President Obama and PM Brown exchanged gifts. The British leader presented the President with two pens, both of which came from trees of great symbolic significance (I believe one was, in fact, from the same tree used to create the President's desk. You'll forgive my senior moment with the other pen.). The President reciprocated by presenting PM Brown with a collection of American classic films. My initial reaction? How tacky. I get that the Obamas represent the Every American. But they are also meant to represent the grace and integrity of this country. Do screwball comedies convey that tone? Most certainly not. Do sleeveless arms, when every other woman leader/spouse of a leader in history has at least partially covered her arms, with a sweater or some other garment in full view? Most definitely not. I suppose I am in the minority opinion here. We are, after all, in the age of "anything goes". But as much as I'm trying to stay neutral, and reserve judgement, it sure seems like the Obamas are trying their hardest to push the envelope. In the end, they may just end up being known for their rebellion and utter reworking of America- for the worse- despite all their rhetoric of hope. So come on, Michelle. Just put that suit jacket on! The Queen would so very much approve. My general attitude on YouTube? Make it work for you. I once heard a teenager exclaim, on Shabbos no less, that it's his favourite site, and while I'm not that level of enthusiastic, I admit that YouTube has its uses. First, where else can you find videos for your every mood? If I'm feeling extra-frummie, I'll listen to MBD or watch Rabbi X visiting Y. If I'm feeling my usual level of frummie-ness, I may catch some fan vids for my two shows-of-late. And if I'm feeling just plain ol' homesick for the Great White North, there's plenty to fill the void. This past week I stumbled upon one of the funniest videos I've seen. Period. Granted, you really need to be from Canada to even remotely get the humour. But it was hysterical, and definitely not in a feel-good, frummie way. Then, just now, to equal my current cornball mood, I came across this transparently fake, yet aw-shucks-worthy vid. I'm telling you, I'm becoming a total softie in my old age! Since I haven't gotten around to getting the stuff for Shalach Manot yet, I was kicking around the idea of just baking some cookies/cakes and calling it a day. So I did an informal poll of my friends to see whether or not they would eat anything I made. Alas, as one friend put it, people don't bother making stuff for Purim anymore. That is, to be frank, a primary reason for my wanting to make stuff! First, I really miss that aspect of Purim "out-of-town"; I used to look forward to eating my friend's famous___, etc. But second, and just as important, is that baking/cooking yourself sidesteps the whole need to keep a mental Rolodex of who eats what "brands". As cited in previous posts, I am most familiar with the blatant sorting system people use here: stuff I eat, stuff I put in a box and offer to everyone who stops by my house Purim day. Since my informal poll and my friend's advice are basically pointing to need to buy and assemble, I guess I'll just buy some junk and throw it in a bag. Let's face it: my bags never make the cut anyway, in a neighbourhoods where people send silver platters of goodies. So why even try? But here's to hoping that one year, soon, people will go back to making things themselves. Because in my mind, doing so is much more aligned with the "spirit" of the holiday. Rest of life- with a score like the first one, does it really matter? This past Shabbos, I had the pleasure of seeing my friend S. Around seudah shlishi, she told me an inspiring story of an Israeli baal teshuva who shares his story. If anyone has any details, feel free to contribute. In brief, this man was a drug addict and a criminal living here in America. One night he overdid it, and while in the taxi cab about to go home with his girlfriend in tow, he felt himself dying. He then felt himself hovering over the cab for a moment, during which he saw the entire lives of both his girlfriend of the taxi driver and his girlfriend. And the next moment he was up in shemayim. There, he found himself in a stadium filled with billions of souls. And he was without clothes since he had performed no mitzvos. None. So he pleaded for a second chance, in order that when he should return, he would have merit. Snap! There he found himself, back in the cab, and related what happened to his girlfriend. When she protested, he was able to tell her a shocking detail of her life, which she admitted she had never shared with anyone. The man of course became a fervent baal teshuva. I thought about this story and found it a wonderful metaphor with which to guide one's life. For all those people who want to expand their wardrobe, they can focus on expanding their spiritual clothing collection! Every time we are faced with an opportunity to do a mitzvot, we can remember that we are building our wardrobe in the world to come! At first I figured that I would properly forget to apply this lesson to my daily life. But then this morning, I found that I was able to focus better in my davening because I said to myself: I'm donning my armour, to protect myself from all the norishkeit and gashmius of the day. I guess it seeped deeper within me than I expected, B'H'! So thanks, S, for sharing a wonderful story that is already inspiring me to stride higher in my spiritual health! I didn't think it could get worse at work. It did. My team has now entered the territory where our manager is downright over-the-line. I mean, it's beyond hellish. But, B'H', at least it's a job when there are literally no others in my field out there right now. So as I said to my co-teammate, we either keep sucking it up or...you get the picture. I haven't had time the past week or so to do anything. I marvel that I even managed to post the few lines that I did. Between working like a swirling dervish and fighting whatever I've been fighting since last month, I didn't even find time to get to the pharmacy to fill my fistful of prescriptions. So when I saw the wonderful snow outside today, it really bolstered my spirits. Finally, a real snowfall, and even more wonderful- it fell when Brooklyn should be transitioning into spring already. A guilty pleasure indeed. And while it is by no means a Canadian snow (the multiple inches had basically melted by the time I went outside an hour ago to finally procure the said prescriptions), it almost felt like an early winter day back home. You know, like November.